The Temple of Veeshan boots for magician is really of low quality. Next time i need to click some bandages into existance, ill go do a 15 hour quest? 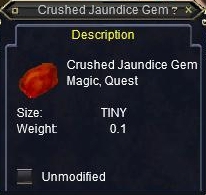 In addition, i would like to state that theres a lot of crushed gems, so jaundice ones will have to be a drop u camp a few hours to get. I camped 4 hours in Sirens Grotto on the Enthralled monkeys, and another 2 hours Wyvyrns in Cobalt scar without success. Looted this off named raptor: Rapticor, in Wakening Lands. He had a ton of HP, but fear kiting him it just took a while. No harm done to me. Got this today off an enthralled moltor (spelling) in siren's grotto.